…and purposefully so, I’d argue. 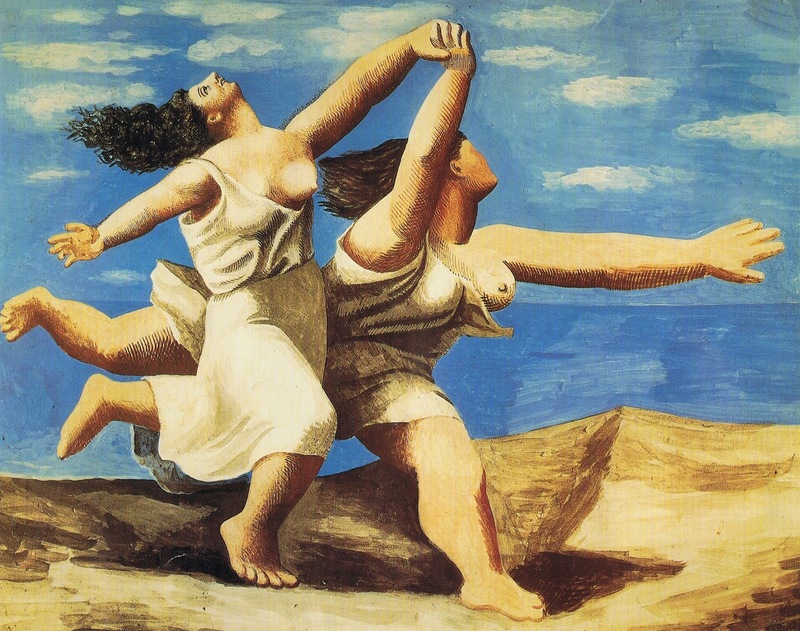 At the top is Picasso’s Two Women Running on the Beach from 1922. The women are usually identified as maenads, who make a habit of running around in bacchic frenzy, partying or tearing somebody limb from limb, and if you keep that in mind the painting might actually hold some sort of balance between frenetic energy and downright goofiness…that is, until you see the Dalí beneath that, which is Women Lying on the Beach from 1926. 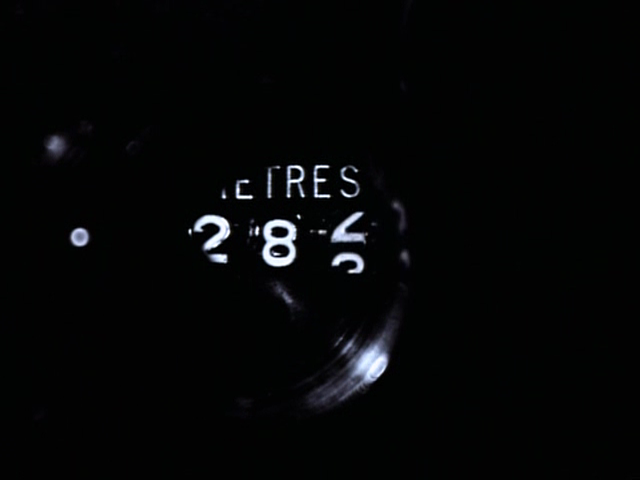 It must be a direct riposte, no? An after to Picasso’s before, there’s even a woman with a leg cramp! He’s pulling Pablo’s leg? Actually we know that Dalí had a color reproduction of the Two Women on his studio wall at the time, says Ian Gibson’s biography of the man (quoting the painter’s sister). 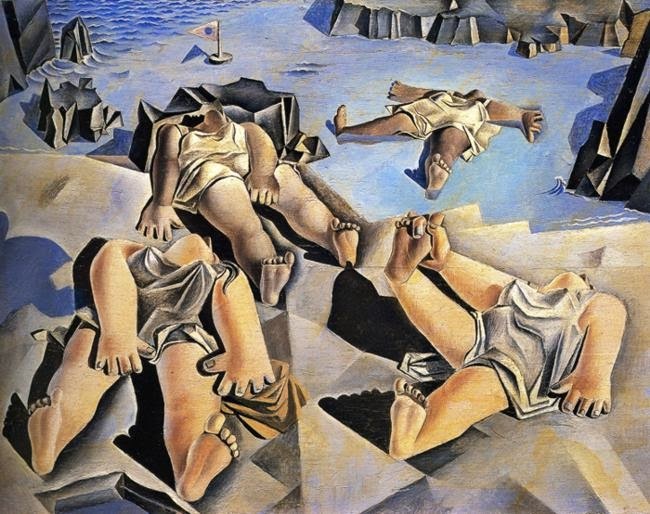 But Gibson doesn’t mention the Women on the Beach, and usually the influence of Picasso’s neo-classicist works on the younger painter is illustrated with a very related Dalí work, the much better known Figure on the Rocks, also from 1926. Here a single woman is glued to the rock in something close to a crucifixion pose, with overtones of Prometheus waiting for his eagle to return. She actually has one upstretched leg like the woman with the cramp, but here it’s rested on a sort of rocky pedestal. So indeed, one might approach this painting in proper terms and conclude that Dalí used Picasso’s sturdy neo-classicism to give the topic some weight…and yet, the Three Women stand more for what I like in early Dalí (I'm reacquainting myself with him for work, so I’m thumbing through the complete paintings and reading the biography), the way he comes to Paris just asking for trouble, taking over Tanguy’s complete shtick wholesale, or trademark elements of Arp or Ernst, somewhere between appropriation and poking his tongue out. This confrontative attitude in hindsight gets kind of lost through our knowledge of the myth-mongering to come. Dalí also doesn’t say anything, and this appears an indication that he’ll be worthy of the master. 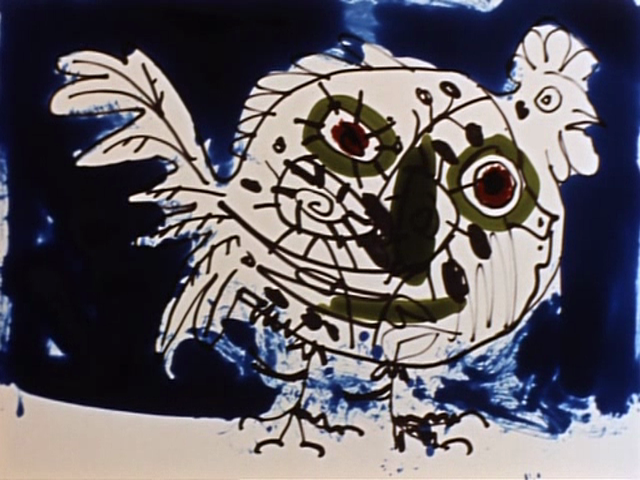 Picasso would remain a lifelong obsession: in the early 1930s, for example, Dalí pretended the two of them had collaborated on an etching, though, to quote Gibson, “without the knowledge of the older artist, Dalinian additions were made to a previous Picasso print [Three Bathers, we’re staying on the beach] and then a new engraving of their ‘collaboration’ was run off.” Or, in 1933, there was a double portrait of Picasso being Dalí made by Philippe Halsman, who often collaborated with the latter on elaborately staged photographs that cemented the myth of the mad genius (who levitated cats or exercised his moustache). 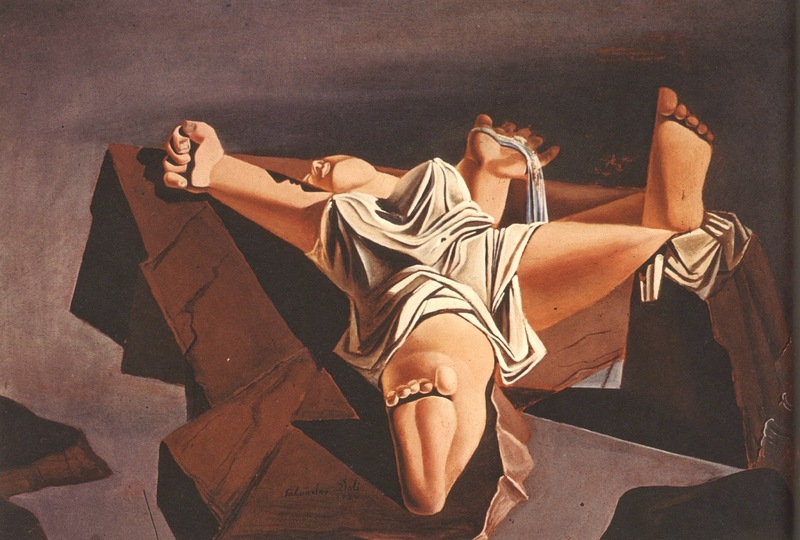 One could easily characterize Dalí’s behavior as trollish (in the modern sense of the word), before they drifted into different camps politically, which led Dalí to attack Picasso as an anarchist, and Picasso to ignore the younger man altogether. 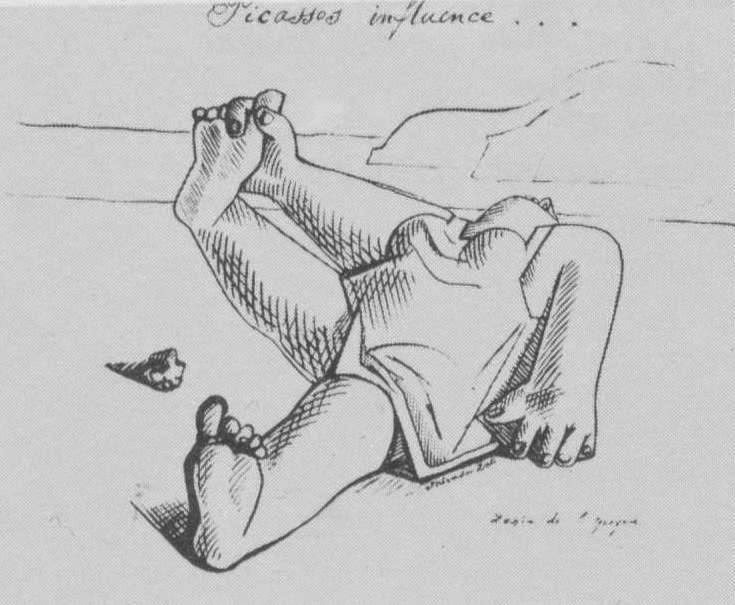 Anyway, to come back to the initial pairing of paintings, I also found a little undated sketch, probably from that later period (I guess, since it is inscribed in English) of one of the Women at the Beach. And while the joke this time is a different one, note that again the motif is used for a joke: “Picasso’s Influence,” it says on top of the sheet. I need Picasso like I need a cramp in the foot. The point of Dalí’s obsession was genius. 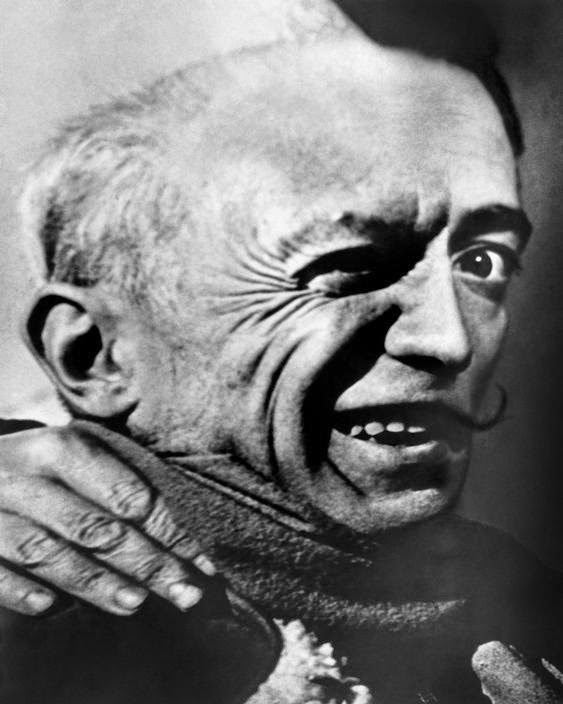 Picasso was regarded as the officially approved undeniable genius as a force of nature, while Dalí had to work for/with the concept, receiving inspiration through the antennae of his moustache, defining and redefining his role (“the only difference between Dalí and a madman is, Dalí is not mad…”—by the way it takes him ten times as long to throw the punch line in the clips I’ve seen, often his humor gets lost in the delivery). Of course, his is also the much more tolerable concept of genius compared to standing around in underpants and projecting virility pointing a brush…but then again when I think of that Picassoan self-image, I have to think of the film The Mystery of Picasso by Henri-Georges Clouzot from 1956, where the protagonist bends gender every bit as subtly as his rival, the professed masturbator. “Just stop at the black,” the director says. “Should I get the inks ready?” asks the artist. “Yes but quickly, we have two minutes left.” They turn to color and Picasso draws a silly head over the whole thing, interested only in how he can create, one thing after another, no matter what. Then time is running out again, and no aesthetic conclusion seems in sight, will we have to stop prematurely at what is not yet a satisfying image? 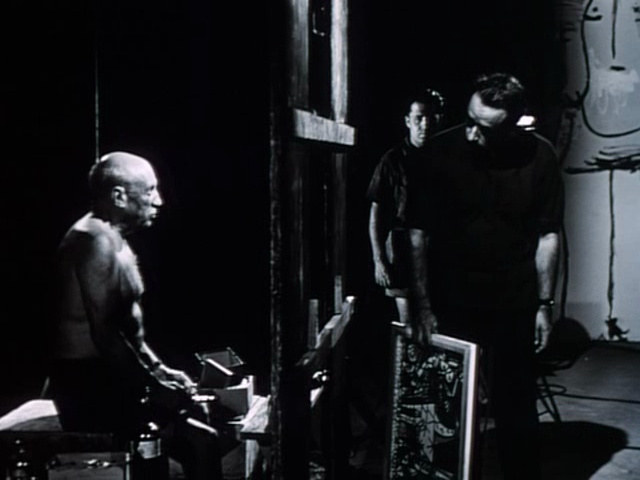 No, Clouzot says he’s been cheating, there’s still more film left. You can do that to Picasso. If you keep him as an art slave tied to your bedpost, he will deliver every time. 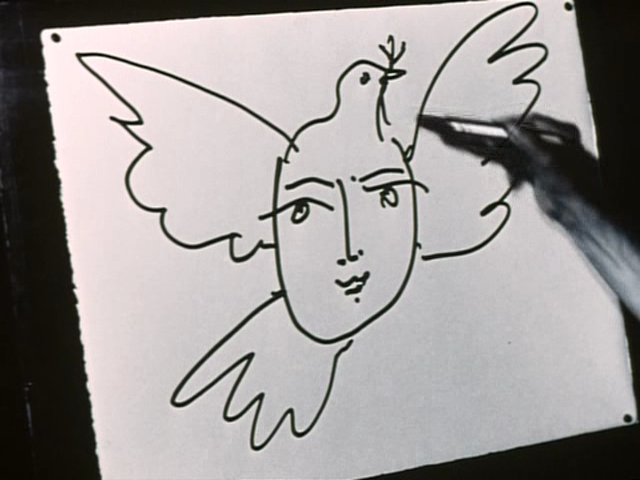 Picasso draws what is probably a picture of his genius, a smiling face and around it the dove that always keeps coming back carrying an olive branch from newfound territories. The artist has no need to question himself, surely he has no shame, and maybe it’s the purest form of genius, unhampered by any intentions.